Nitro PRO triggers the production of nitric oxide to damaged tissues to increase blood flow, stimulate the development of new blood vessels and prevent capillary blockage. 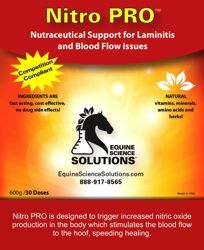 Our unique precursor technology and nitric oxide delivery system supports blood flow to the hooves and other devitalized tissues. Our technology, unlike other products, provides sustained serum levels of nitric oxide for over 6 hours with a single dose. Veterinarians are increasingly turning to Nitro PRO for the base support of their treatment of laminitis.